conspiracy-themed TV classic was too close to the truth. Alien conspiracies, monsters, cryptids, mutants, paranormal phenomena -- just a typical day for the fictional FBI agents of "The X-Files." But how close to fiction was it? 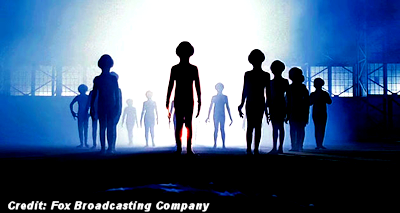 Creator, writer and director Chris Carter tells a real-life tale about the show in its early days that's worthy of the show's catchphrase, "The truth is out there." "I had someone come up to me during the original run of the series, who said they worked in some high place in a secret government agency, [and] said that we were very close to the truth," Carter told The Huffington Post. "I didn't know whether to take that person at their word or not. I can tell you this: When I wrote the  pilot, I called the FBI to do some research, and they were nice enough, but didn't really give me the time of day.